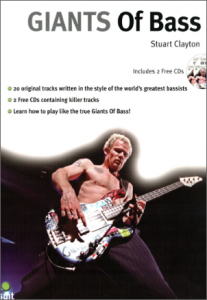 Back in 2004, I wrote a book for Sanctuary Publishing called Giants of Bass. It was based on a similar book that the company had published for guitar and featured twenty famous bass players, mostly of my choosing. For each player I wrote a biography, a selected discography and gave advice about their individual playing style. There was also a full-length piece of music written in the style of each artist – not one of their actual songs, but something that sounded like they might have written it. This was done – as it always is – to avoid having to license an actual piece of music, which is a time-consuming and costly business. Over the last few years I’ve been stocking Giants of Bass on my Bassline Publishing website and it’s sold well. I recently called the publishers (now Music Sales), to purchase more copies, only to be told that the print run had been exhausted and the book was now out of print. They also confirmed that the rights to the book could revert to me as they did not intend to reprint it. Although I initially considered simply reprinting the book as it was, I eventually decided to look through it and see if there was anything that could be improved upon. It turned out that there was: twelve years later, I’m a far more experienced bass player and writer and I instantly saw a lot of things I would like to change. Listening to the audio brought similar realisations: whilst the compositions stand up quite well, the programmed drum sounds are terrible by today’s standards and many of the other instrument parts could have been written/executed better. In terms of the bass playing on the tracks, I felt that more could be done to replicate the original tone of the artist in question and there were several instances where I would now be in a position to use a more appropriate instrument to record some of the lines. So, I’ve decided that starting this summer, I am going to extensively rework this book for re-publication next year (hopefully). I’ll be re-writing and updating all of the biographies, sourcing appropriate photography (the original book had none) and re-recording all of the music. This latter task is going to be the biggest part of the project, but it’s the part I’m looking forward to the most. None of the original tracks exist any longer, so I’m forced to begin again from scratch. I see this as an opportunity to re-record the pieces using some of the amazing musicians I’ve met and worked with over the last twelve years. I’m lucky enough to count amongst my friends several superb guitarists, keys players and drummers and I intend to use all of these excellent musicians to their maximum potential. I’ll also be updating some parts of the compositions, adding new sections and re-writing certain parts. Finally, I’ve decided to tweak the list of ‘giants’ featured in the book. The original included twenty, but as I looked over it, I noticed some glaring omissions – how can such a book not include names such as Steve Harris, Carol Kaye, John Myung, Marcus Miller, or Rocco Prestia?! The good news is that the new edition will: I’ll be updating the list of players featured to include twenty-five rather than twenty, which means writing five new pieces of music…! It’s going to be a big book. Over the course of the next year or so I will be writing regular blogs about my progress on the new edition of Giants of Bass and I’ll be shooting videos during important recording sessions. I’ve started as I mean to go on – a video to accompany this blog can be viewed here. I hope you’ll enjoy being part of this process and having an insight into how a project like this comes together.